Cloze questions (embedded answers) are a special type of reading comprehension task where a passage of text has various answers embedded within it. 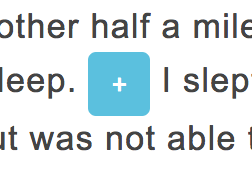 In the TrackTest English test, you can typically find this type of tasks in the reading comprehension section. You are asked to fill the gap with the right option (headline or sentence) fitting the context of the article. Options expand when you click on the blue plus sign. Used options are strikethrough. While working on the specific page, you can return and change your choice. It works in the both desktop and mobile view. You can find more about the Cloze (gap fill) test questions on Wikipedia.